print Print What does my cat's body language mean? What does my cat's body language mean? If you're concerned about your cat's behaviour speak to your vet first who may then refer you to an animal behaviourist. 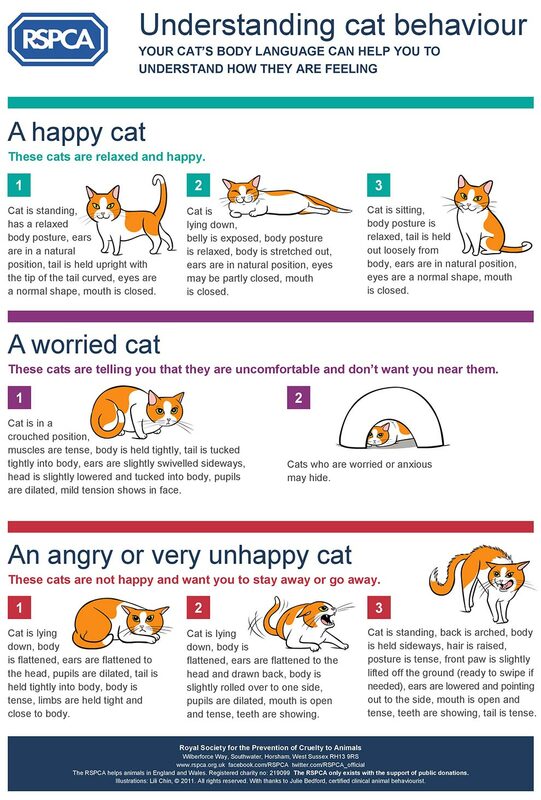 View the cat behaviour infographic. These cats are relaxed and happy. Cat is standing, has a relaxed body posture, ears are in a natural position, tail is held upright with the tip of the tail curved, eyes are normal shape, mouth is closed. Cat is lying down, belly is exposed, body posture is relaxed, body is stretched out, ears are in natural position, eyes may be partly closed, mouth is closed. Cat is sitting, body posture is relaxed, tail is held out loosely from body, ears are in natural position, eyes are a normal shape, mouth is closed. These cats are telling you that they are uncomfortable and don't want you near them. Cat is in a crouched position, muscles are tense, body is held tightly, tail is tucked tightly into body, ears are slightly swivelled sideways, head is slightly lowered and tucked into body, pupils are dilated, mild tension shows in face. Cats who are worried or anxious may hide. These cats are not happy and want you to stay away or go away. Cat is lying down, body is flattened, ears are flattened to the head, pupils are dilated, tail is held tightly into body, body is tense, limbs are held tight and close to body. Cat is lying down, body is flattened, ears are flattened to the head and drawn back, body is slightly rolled over to one side, pupils are dilated, mouth is open and tense, teeth are showing. Cat is standing, back is arched, body is held sideways, hair is raised, posture is tense, front paw is slightly lifted off the ground (ready to swipe if needed), ears are lowered and pointing out to the side, mouth is open and tense, teeth are showing, tail is tense. Find out more about the environmental needs of cats.